The causes and consequences of the British exit are currently being pored over by every conceivable news organ, think tank, and political and economic institution. I don’t think I can add anything original to the torrents of analysis but can point to a good overview of the crisis and a piece that offers useful historical perspective [full disclosure: Mark Mazower was my doctoral thesis advisor]. However, as the Brexit news streamed out I looked to the newly translated book of essays by the great Austrian Jewish writer Stefan Zweig. His writing was from the precipice – Europe on the verge of war, at the onset of the Great Depression, during the fascist rise. Although pessimism born of exile got the better of him (how many more did the Nazis kill indirectly and remotely? ), his writing during these moments of crisis always expressed an optimism in Europe, or his idea of a possible Europe. Zweig’s Europe was humane, heterogeneous, and cosmopolitan. His vision deserves to be recalled at moments like these. So, here are two quotations drawn from Messages from a Lost World. The first is from Zweig’s unfinished essay on European unity. The second is the epigraph of the anthology taken from Nietzsche. For us who have found ourselves here reunited around an idea, I feel there is no longer a need to discuss the necessity and compelling logic of that idea, for to do so would simply be to waste time. All the leading heads of state, intellectuals, artists and scholars have been convinced for some time now that only a slender allegiance by all states to a superior governing body could relieve current economic difficulties, reduce the propensity for war and eliminate anxieties aroused by the threat of conflict, which are themselves one of the primary causes of the economic crisis. Our sole common task, then, is now to shift our ideas from the sphere of sterile discussion to one of creative action…The European idea is not a primary emotion like patriotism or ethnicity; it is not born of primitive instinct, but rather of perception; it is not the product of spontaneous fervor, but the slow-ripened fruit of a more elevated way of thinking. It entirely lacks the impassioned instinct which fuels patriotic feeling, and thus the sacro-egoism of nationalism will always cut more keenly through to the average man than the sacro-altruism of the European ideal, because it is always easier to be aware, through a spirit of devotion and veneration, of one’s own kind than of one’s neighbor. Thanks to the pathological alienation which the nationalistic idiocy has established and still establishes among European peoples, thanks as well to the short-sighted politicians with hasty hands who are on top today with the help of this idiocy and have no sense of how the politics of disintegration which they carry on can necessarily only be politics for an intermission, thanks to all of this and to some things today which are quite impossible to utter, now the most unambiguous signs that Europe wants to become a unity are being overlooked or willfully and mendaciously reinterpreted. 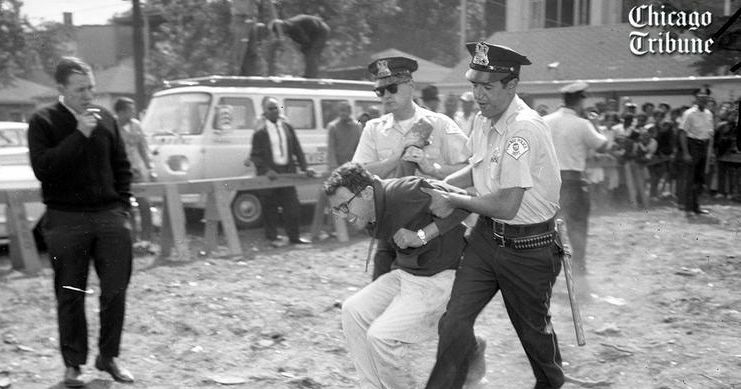 Bernie Sanders getting arrested in 1963 while trying to desegregate Chicago schools. Tomorrow, New York State will have a fairly decisive vote in the Democratic primary process. If Bernie wins, that would be eight states in a row and would seriously undermine Hillary’s expectation of coronation rather than nomination. If he loses, this makes his path to the nomination much more difficult, if not nearly impossible. By now there have been various pieces from Hillary supporters ranging from thoughtful statements to moronic ALL CAPS SCREEDS. Bernie supporters have mirrored this spectrum with important reminders about Hillary’s record and, unfortunately, have written pieces that try and fail to rationalize his flawed position on guns. I hope what I say below will lean more towards one side of the spectrum than the other. I have never before given money to a campaign, volunteered, or waited hours to attend a political rally. I have done all three for Bernie and plan to vote for him tomorrow for mainly one reason: morality. Whereas many people of good faith in the Clinton camp see Bernie’s attacks on inequality as a useful if monotone focal point in this year’s campaign, I see inequality, or better put, social justice as the basis for interest in politics per se. If the (im)moral vision of Donald Trump is enough to compel liberals to froth at the mouth and even suggest re-registering as Republicans to back Marco Rubio [as if he’s somehow “better” than Trump], why shouldn’t moral values determine the candidate that one is truly for? There are essentially three answers usually proposed in response by Clintonites. The first stock answer from Clinton supporters has been as follows: Bernie represents everything I hope and wish for, but I think it won’t be achievable and Hillary might be able to actually do something. Many of the people who say this voted Obama, effectively moving from “Hope” to “Nope.” This question of idealism and pragmatism is certainly not a new one. “Do you think that someone is a worse painter if, having painted a model of what the finest and most beautiful human being would be like and having rendered every detail of his picture adequately, he could not prove that such a man could come into being? No, by god, I don’t. The point, of course, is that the theoretical vision matters, and particularly at this moment—during a campaign—where every single candidate on all sides is in “I’m gonna”-mode. Remember when Barack Obama was going to close down GITMO and have the most transparent administration in history? The prison camp is still there, and his administration has prosecuted more whistleblowers and journalists under the Espionage Act than all previous presidents combined. I voted for Obama twice. The first time gleefully, the second, grudgingly. Who knows? I might have buyer’s remorse with Bernie, too. However, at this point in any campaign we only have the candidate’s record of past decisions, behaviors, and moral vision for the future. I think, as (strangely) do many Hillary supporters, Bernie wins in this regard. The second objection usually levied by Clintonites against Bernie is the idea that he focuses too much on the economy. I think they have a point here to a certain extent. Social justice is not just economic justice; it also involves racial justice. We are in America, after all. However, the Sanders campaign offered a robust series of objectives for countering institutional racism months ago and has incorporated Black Lives Matter activists into the upper echelons of the campaign staff. Add to this the fact that Bernie literally marched with Dr. Martin Luther King, Jr., was arrested in Chicago for protesting housing segregation, was one of the few Congressmen to back Jesse Jackson’s presidential bid, and has fought for social welfare legislation his entire career. This last point is important. Though it may be true that socio-economic justice is not equivalent to racial justice, it is equally true that racial justice cannot be achieved without socio-economic justice. A person who happened to believe this deeply was MLK. The last indictment of Bernie by Clintonites is that he is unwilling to dirty his hands in order to get things done. In some cases, they actually revel in Hillary’s Machiavellian approach to politics and tendency to use military force to advance her given policy. Once again, MLK’s views are both important and relevant here: it is wrong to use immoral means to achieve moral ends. Bernie has refused SuperPAC money and lobbyist cash, because he rightly believes that they are not the solution to but the problem of contemporary American politics. He has also indicated that he would be much more reluctant to use force to “solve” political problems. He appears to be the only candidate running that understands what is unique about military force: the moment it is used, all things thought to be constants become variables. Consequently, there has to be a very good plan for the peace after the use of force. In other words, war should only be used as an instrument within a larger plan for a durable political solution. It’s odd to say, but it seems like Bernie knows his Clausewitz better than Hillary. In sum, since in political campaigns we only have the moral vision and actions of the candidates to go on, it is precisely those candidates whose principles coincide most closely with our own that should be our obvious choice. With the options we have tomorrow, Bernie Sanders is the clear choice by all accounts. Hillary supporters often worry that after the party “inevitably” anoints its candidate that Bernie supporters will not come around and unify the Democrats. Their fears are well founded. I would find it very difficult to vote for Hillary, though, to be frank, should she become the nominee I probably would vote for her in the general election. However, I am adamantly against her in the primary. Why? First of all, let me dispense with red herring of sexism. Yes, Hillary Clinton has been subject to sexist ridicule that no male candidate has had to suffer through. This is incontestable and attests to the fact that we live in a depressingly misogynistic society. It does not, however, make her a choiceworthy candidate. I, too, would be overjoyed with and prefer to have the opportunity to vote in our first female president. I’d prefer to because it’s about goddamn time, and I want my daughter to see a woman at the pinnacle of power. I’d like that woman to be Elizabeth Warren. If she were the other Democratic candidate today, as much as I like Bernie, I’d drop him like a bad habit. The main reason I cannot vote for Hillary Clinton, however, is her view on foreign policy. While Hillary might be better on guns at home than Bernie, she’s immoral and incompetent on guns abroad. It is baffling to me that anyone with self-professed progressive values could be taken with what is often described as her “nuance” and “firm grasp” of foreign policy. Policy-wonkishness is not tantamount to good judgment. This brings me to her foreign policy guru: Henry Kissinger. When Hillary touts the original Darth Vader as a fan of her work—a man who literally has the blood of hundreds of thousands of innocents on his hands—I am awestruck that anyone could consider voting for her. Yes, Bernie stumbles when asked about foreign policy and sounds pretty bad. Hillary seems very comfortable with foreign policy questions and sounds much worse. This latter point is the grand irony of the question of the pragmatism often brandished as the clinching element for the undecided-yet-leaning-Hillary voter. Henry Kissinger was the master of short-term, Machiavellian pragmatism. This approach brought the backing of the cruel regime of the shah of Iran, produced the rise to power of the Khmer Rouge in Cambodia, and helped place General Pinochet and his death squads in power in Chile, to name just a few policy outcomes. Or, as Barrett Brown has brilliantly put it, he represents the-ends-justifies-the-means-and-oops-we-fucked-up-the-ends-too foreign policy establishment. It was this Kissingerian pragmatism that brought about Hillary’s Iraq War vote and her latest adventure in Libya. Thus far, up to 175,000 civilians have been killed in Iraq and nearly 30,000 have been killed in Libya; both countries have become havens for ISIS and various other terrorist groups. So, New Yorkers, when you go to the polls tomorrow, please remember that you are voting for candidates who are making claims about what they will do. At this point, all we have to go on are their past actions, their claims, and the moral implications of both. And going on that, Bernie Sanders is the clear choice. Greg Grandin, Kissinger’s Shadow: The Long Reach of America’s Most Controversial Statesman (New York: Metropolitan Books, 2015). Imagine for a moment that you are standing before the threshold of a Spanish colonial mansion bedecked with carefully placed and impeccably manicured tropical plants. A gentle breeze sways the palms overhead and you can hear and smell the waves of the Caribbean caressing the beach that is just a few hundred yards away. You walk through the door and are enveloped by the sumptuous and tasteful décor, all wood, marble, and overhead ceiling fans for that touch of colonial tropical authenticity. You are ushered through the cavernous house and into the elaborate gardens of the rear that provide a dappled light, a comfortable transition to prepare you to be properly sun-kissed on the private beach. You take your place on a cushioned reclining chair and are handed a drink—let’s say something refreshing with rum, mint, and a spritz. Can you picture yourself there? There is obviously only one thing missing from this scenario: Henry Kissinger. Apparently, that is what Democratic presidential candidate Hillary Clinton thinks. The Clintons, Henry Kissinger, and his wife Nancy have spent their winters together for years vacationing at the opulent home of the famed Dominican fashion designer Oscar de la Renta, as Mother Jones has recently reported. Why should such personal leisure idiosyncrasies be newsworthy these days, one may ask? In what became an important moment in one of the Democratic primary debates in early February, Hillary Clinton name-dropped Henry Kissinger and his approval of her foreign policy in an attempt to diminish Bernie Sanders’ seriousness and qualifications for the presidency. It didn’t work. Instead, it unleashed a flurry of think pieces on and assessments of Kissinger’s tenure and legacy. While there are the usual “10 worst” lists and synthesis pieces, nothing compares to what the historian Greg Grandin has achieved in his recent intellectual/professional biography, entitled Kissinger’s Shadow. Grandin, a scarily prolific writer, also contributed to the burst of Kissinger assessments after the debate, publishing an excellent piece in The Nation the very next morning. As good as that article is, consider what follows to be a very strong pitch to sit down and read his brilliant book in its entirety. However, be advised—if you do end up on a nice beach with a drink in your hand, I’m not sure this book is the one to bring. The Combined Arms Center in Fort Leavenworth, Kansas is where US Army formulates and codifies its doctrine. In addition to the high priests of counterinsurgency warfare and conventional tank strategy, since 1985 Leavenworth is also the home of the Center for Army Lessons Learned (CALL). Headed at its inception by then Colonel Wesley Clark, CALL publishes studies of what went right and what went wrong in America’s past military engagements. Politics, strategy, and tactics—the Clausewitzian triptych—are all considered. In essence, the Army studies the past in order to learn from past mistakes and in hopes of avoiding them in the future. Such a use of historical data would be anathema to Henry Kissinger. What is perhaps the greatest take-away from Grandin’s study is that Henry Kissinger does not believe in reality, and that this mental orientation has governed his policy-making and advisory role for the entirety of his all too long career. That is to say, the archetype of the realist school of foreign policy does not believe in reality. This rejection of the notion of a shared world made up of observable and verifiable facts is based on Kissinger’s metaphysical conception of being, which Grandin describes as comprised of “equal parts gloom and glee.” The gloom comes from an existentialist belief in the absurdity and ultimate meaninglessness of existence. A German Jew, Kissinger came to the United States in 1923 at the age of fifteen and thus escaped the rise of Nazism and the Holocaust. Twelve of his family members did not, and this cemented his pessimistic outlook. However, unlike Theodor Adorno, another German Jewish transplant in America, he didn’t think writing lyric poetry after Auschwitz would be barbaric. It so happened that Kissinger’s lyric poetry was Machiavellian foreign policy memos. And here we have Kissinger’s gleeful element: if all history is suffering and barbarism and there is no point to being per se, then why not embrace it and act boldly. Since there is no Divine plan, no Fate, then one is radically free and able to act as such, though within some of the pre-existing constraints that preceded one’s existence. To the pessimistic belief that life has no meaning, Kissinger had a positive response: YOLO. What may appear to be an unnecessary detour into the inchoate philosophical musings of a graduate student actually sheds light on the rationale of Kissinger’s policies and his blasé attitude toward the destruction it often wrought. The epigraph of the book quotes Kissinger stating that, “The West requires nothing so much as men able to create their own reality.” Not only, as Grandin notes, do we hear the echo of this sentiment in Karl Rove’s “reality-based community” claims during the Iraq War, this is an orientation that can be thought of as a response to the existential void. Faced with the death of God, Kissinger suggests one should try and play God on earth, if only for a fleeting moment. Unfortunately, the god of war was the deity he most faithfully emulated. The litany of terror produced by Kissinger’s policies is too long to comprehensively address (read the book!!). However, an exemplary case of Kissinger at work was the secret bombing of Cambodia from 1969-1973. By the late 1960s, the Vietnam War was raging and the North Vietnamese communists used the snaking supply route known as the Ho Chi Minh Trail to send resources and reinforcements to their southern allies. Having gained approval from the Cambodian ruler Prince Sihanouk, the North Vietnamese purposefully directed the trail over the Vietnam-Cambodian border. With domestic support for the war waning after the 1968 Tet Offensive and the onset of the draft, Kissinger did not want to go to Congress to get approval to bomb another sovereign state on whom there had been no declaration of hostilities. How quaint. In our era of endless, borderless, robotic death from above, the notion of having to get Congressional approval for bombing countries against whom we have not declared war seems passé. It is. It is because of the precedent set by Kissinger in Cambodia and also in neighboring Laos. In Laos, up to 30,000 civilians were killed and the intensity of the bombing was even greater. Laos remains the most bombed country in history. From 1965-1973, the US bombed Laos every eight minutes. Approximately 280,000,000 bombs were dropped on Laos—about one ton of explosives for each Laotian—and about 80,000,000 million cluster bombs are still buried in the soil, unexploded. More precisely, they are exploding over time and have killed over 20,000 people from the end of the fighting in 1975 to 2009, 40% of whom were children. Add to this the tens of thousands of limbless and maimed of Cambodia and Laos and the bombing campaign over North and South Vietnam, and we have about 1,000,000 civilian deaths due to bombing in Indochina (2,000,000 other civilians died due to the ground war). As one recent history has estimated, the amount of bombing firepower expended in this region by America from 1964-1975 is the equivalent of 640 Hiroshimas. The US Army has been grappling with what lessons to learn regarding the Vietnam War for decades. However, one of the Army’s favored son’s (until recently), Gen. David Petraeus, argued that one should be wary of reasoning by historical analogy. “Perspective and understanding” are what one can hope for in historical analysis and that dogmatic analytical conclusions must be avoided. He, of course, was hoping to rescue counterinsurgency from its déclassé position in American strategic thought due to its failure in Vietnam. Thus, the purpose of history is to provide context, but it shouldn’t end up hamstringing action: “It would be more profitable to address the central issues of any particular case that arises than to debate endlessly whether the situation could evolve into ‘another Vietnam.’” For all of Petraeus’ critique of historical analogy, he ends up with Kissinger’s philosophy of history: study and value history only insofar as it lets you tell the story you want to tell in order to do what you want to do. This is what Grandin aptly calls Kissingerism without Kissinger. What did Kissinger learn from Vietnam, Cambodia, and Laos? After the fall of Saigon in 1975, he had this to say at a press conference: “The United States must carry out some act somewhere in the world, which shows its determination to continue to be a world power.” Some act, somewhere, some day, bombs away. Ted Cruz’s response to the Brussels’ terrorist attacks has been rightfully and roundly criticized by liberal media outlets and the Council on American-Islamic Relations. However, what the liberal outrage gets wrong about Cruz’s suggestions is that such measures would be out of step with American traditions and security policy. As recently as 2014, the NYPD had a special branch of its intelligence division, the Demographics Unit, dedicated to running surveillance specifically on the NY-metro area Muslim community at large, from kebab stand workers to mosque attendees to Muslim student associations as far off as Philadelphia. This is to say nothing of the FBI’s infamous COINTELPRO (Counter Intelligence Program) of the late 1950s-1970s that infiltrated and tried to disrupt the activities of, among others, left-wing student organizations, anti-Vietnam War protestors, and members of the civil rights movement, including Martin Luther King, Jr. To “patrol and secure” whatever the majority of the American population happens to fear at a given moment is firmly within the traditions of American security policy. Ted Cruz’s call for specialized surveillance of an entire group of the American populace for the sake of security is actually the reappearance of an old theme in American history. Recall that the first organizations that resembled police forces in America were the mounted slave patrols that were tasked solely with finding African Americans. To identify and watch over a particular swath of the population is not some sort of aberration but rather the norm in the American way of security. This is American policy on autopilot—cruise control is Cruz control. To register that such an approach is within the traditions of American policy-making and execution is, of course, not to endorse it. Such ways of providing security have been and will be disastrous to the American Muslim community. They should be opposed on moral, pragmatic, and legal grounds, and in that order. The reason for this is that while the US has had a relatively short history of dealing with terrorism done in the name of Islam, the example of French security policy vis-à-vis its Muslim community across the 20th century can point us to the folly of adopting such an approach. From 1925 until approximately 1980, the Paris Prefecture of Police had a specialized unit whose only tasks were the political surveillance and criminal investigation of Muslims from France’s North African colonies, Morocco, Tunisia, and, most importantly, Algeria. This police service had number of monikers but was generally referred to by police officials and the press as the North African Brigade. Its main task was to collect information on the entirety of the Muslim community in Paris and repress anti-colonialist and nationalist feeling. It didn’t work. What it did do was further entrench a hierarchy of belonging in France. After 1947, Algerians living in France were by law French citizens. However, with the specialized policing program they were not treated as such, and this fact was not lost on them. Thus, not only was it deeply immoral to treat an entire segment of the population as suspects rather than citizens based simply on their identity, it also did not produce the intended results. That is to say, all three North African colonies gained independence, and North Africans in France became increasingly wary of any interaction with the French police. While legal opposition to such policies might be useful insofar as they constitute opposition per se, what French and American history demonstrate is that the laws can always be tweaked in times of crisis to legalize government actions. The French invented the “state of emergency” during the Algerian War to provide the government security forces with a freer hand, and the US passed the Uniting and Strengthening America by Providing Appropriate Tools Required to Intercept and Obstruct Terrorism Act, aka the USA PATRIOT Act, in 2001. Shortly thereafter, American lawyers in the Office of Legal Counsel redefined torture, which, incidentally, the French had also used extensively in Algeria in the late 1950s. America has some great traditions. The demonization of entire communities in the name of security is not one of them. Ted Cruz’s proclamations about essentially criminalizing Muslim identity should be rejected. But don’t waive the Constitution in his face to denounce such recommendations. There could well be a process whereby Muslim surveillance becomes constitutional given what has been approved by our legislature and judiciary. The September 18, 2001 Authorization for the Use of Military Force and the November 13, 2001 Executive Order on Military Commissions have created the grounds for perpetual war coupled with the near suspension of habeas corpus since 2001. The fragility of law during times of emergency, real or imagined, has been known since antiquity. The Roman statesman Cicero noted, “In times of war, the law falls silent.” Events like these terrible attacks in Brussels, which involve equal parts tragedy, fear, and anger, are a test for American society. They can also act as a reminder to mobilize the forces of collective morality so we can hopefully get out of cruise/Cruz control. The centenary of WWI has produced a flurry of new works that consider the origins, prosecution, and legacies of the Great War. For anyone with an interest in war or this time period, the past couple of years have been a reader’s dream. What is striking about WWI was just how very modern it was. An underground organization called Unity or Death! produces an offshoot that is even more radical: The Black Hand. It enlists a nineteen year-old, Gavrilo Princip, to carry out a terrorist attack that ends up killing the heir to the Habsburg throne and unleashes a war that by 1916 many observers thought might last forever. If one considers the origins of many current conflicts in the Middle East, the birth of the Soviet Union, and the rise of fascism as both a militarized form of mourning and expression of anger over the WWI settlements, it might not be too much of a stretch to suggest that those observers might have been right. We are, of course, currently living through what the journalist Dexter Filkins has somberly dubbed “the forever war.” How are we to understand out present moment? Given the ever-burgeoning literature on analyzing wars past and present, it stands to reason that readers like me who are interested in these topics would have a somewhat firm grasp on the clashes of yesterday and today. Yet every time I read a newspaper report about conflicts from around the world, I am stunned. War, at its base, is organized groups of human beings inflicting premeditated violence upon one another. How is this possible? Why is it so frequent? How well can history answer these questions? When confronted with the ambient violence of the world that is the daily news, I am confronted with the limits of history. Due to the norms and forms of historical writing, the limits of history become visible as limits of representation. Historians’ truth claims are bound by the documentary record. What we can say absolutely depends on what others said before us—and on whether or not they bothered to note it down somehow. This is not to attack historians but rather to point out the explanatory limits of the discipline with regard to what is one of its chief objects of analysis. A number of impressively skilled historians have explained the origins of war through the careful analysis of war plans, economic incentives, territorial rivalries, ideological differences, the politics of prestige, and the quirks of statesmen. Doubtlessly, these are crucial factors to consider in understanding how wars come into being. However, to my mind, they do not fully explain how warriors come into being. That is to say, they do not provide an adequate account of how ordinary people transform their will to commit acts of violence they would ordinarily consider inhumane. Interestingly, it is in fiction that we may find truth about war and warriors. In his book The Drowned and the Saved, the brilliant Italian Jewish Holocaust survivor Primo Levi asks the question, “Have we—we who have returned—been able to understand and make others understand our experience?” As an answer, he suggests that the human desire to simplify, to arrange people, thoughts, and actions into neat moral categories, is understandable but perverts the complexity and ambiguity of human experience. Reality, especially in times of crisis, is not black and white but exists in what he calls “the gray zone.” It is this gray zone that is so elegantly brought to life in Elliot Ackerman’s new novel Green on Blue. Ackerman is also a man who has, in a sense, “returned” and attempted to convey his experience. A decorated Marine Corps Special Operations officer who served five tours of duty in Iraq and Afghanistan, including a stint as the head of a 700-man Afghan battalion that sought to capture Taliban leaders, his novel is astonishing for the narrative perspective it adopts. Rather than telling the story of the current war in Afghanistan through semi-autobiographical fiction like many of the great war novels—Remarque’s All Quiet on the Western Front, Barbusse’s Under Fire, Hemingway’s For Whom the Bell Tolls, O’Brien’s The Things They Carried—Ackerman reverses the perspective and tells the entire story through the eyes of an Afghan boy named Aziz whose life is irrevocably changed by the wars in his land. Aziz and his brother Ali were left orphaned by “the war that came after the Russians but before the Americans.” Their village obliterated, they eked out a living with other orphans, begging and doing odd jobs in the market town. By their fourth year alone, things took a drastic turn for the worse as yet another war came: “Americans accused men of being militants and disappeared them in the night on helicopters. The militants fought to protect us from the Americans and the Americans fought to protect us from the militants, and being so protected, life was very dangerous.” When Ali is gravely wounded by a rocket attack by the warlord Gazan, Aziz is recruited to join the Special Lashkar, an American-backed Afghan unit, that will allow him to get his badal (revenge) and regain his family’s nang (honor). Thus, Aziz quickly goes from being a child to a soldier and becomes that awful hybrid of modern conflict: a child soldier. The stories, however, prove insufficient to resist the force of circumstance, as we observe the young Aziz lose his innocence and settle into a role that is at once tragic and completely understandable. It is the power of Ackerman’s writing that makes Aziz’s initial choice to take up a life of arms and the ensuing transformations due to that choice utterly believable. Ackerman has performed a colossal act of empathy with this novel. For such sparse prose, there is an intimacy to this work that gives us a glimpse into the particular motivations for war of an Afghani, a boy, a villager, a poor person. We also understand Aziz’s motivations from the universal perspective: Aziz loves his brother Ali. Given all of this, the opening lines of the novel are poignant: “Many would call me a dishonest man, but I’ve always kept faith with myself. There is an honesty in that, I think.” War, like life, is complicated. Ackerman understands this deeply, and, as such, Green on Blue unfolds in shades of gray. Is Donald Trump a fascist? He certainly sounds like one. So strong are the parallels of Trump’s language to the fascist rhetoric of the 1920s and 1930s that I shifted my history curriculum to compare Mussolini and Hitler’s speeches and policies with those of Trump and other members of the political class. Case in point: On Sunday, November 15, 2015, Jeb Bush argued that only Christians should be allowed into the country; Ted Cruz concurred. The next day, Chris Christie stated that Syrian orphans under the age of five should not be allowed into the US. On Wednesday, the Mayor of Roanoke, Virginia, David Bowers, issued a statement suggesting Muslim refugees meet that same fate as Japanese-Americans who were herded into concentration camps during WWII. Finally, on Thursday November 19th, Donald Trump proposed that Muslims in America be specially registered and identified. So, in the span of five days, senior members of the American political class (all Republicans barring Mayor Bowers) called for religious exclusion at the borders, concentration camps, dual legal and surveillance regimes for Muslim Americans, and special insignia. The most outspoken of the lot, Donald Trump, has emphasized his belief that Muslim immigration to the US should be explicitly banned—call it a Muslim Exclusion Act. It sounds fascist, right? No, says Vox Media. The constellation of academic stars Vox queried about whether or not Donald Trump is a fascist categorically rejected the label. Ranging from the usual excruciating academic jargon (“Fascism is a genus of political ideology whose mythic core in its various permutations is a palingenetic form of populist ultra-nationalism”—Roger Griffin) to much more useful arguments (describing fascism as a type of politics “obsessed with community decline, humiliation, or victimhood”—Robert Paxton), each highly respected scholar rejected the descriptor “fascist” for one reason: Trump continues to embrace the democratic process. They argue that because Trump has not questioned the political legitimacy of democracy itself, he cannot be a fascist and thus has much more in common with the “right-wing populism” of France’s Front National. But this conclusion is problematic, and overlooking its deep flaws might well be contributing to what seems to be Trump’s irresistible rise. First, the term “fascism” need not be rendered an ineffective description just because it is not an exact mirror of the classical fascism of the 1920s and ’30s. Should Bernie Sanders not be called a democratic socialist because his platform isn’t a carbon copy of, say, the Weimar Republic’s Social Democrats? Conservatism also means something quite different today than what was articulated by Edmund Burke, but the term is still useful as a category to identify a certain body of thought and action. As Mark Twain noted, history never repeats itself, but sometimes it rhymes. No, Trump does not have an army of Trumpshirts beating political opponents in the streets, but he has responded positively to violence committed in his name, suggesting that his followers are either “very passionate” or that the victims might have deserved to have been “roughed up.” Coupled with statements about a specialized legal regime for certain citizens and a motto that emphasizes reanimating a latent, authentic America, Trump has the rhyme and meter of fascism down pat. Second, while Mussolini and Hitler were not voted into power and relied on the use or threat of force to engineer executive appointments, their parties did use the democratic process to field candidates, thereby gaining popular legitimacy and shifting their ideologies from the lunatic fringe to the mainstream. The anti-democratic nature of fascism reveals itself as such only when it hits the limits of democratic processes. Currently, these processes appear to be going just swimmingly for Donald Trump. Lastly, it’s true that Trump’s campaign may have more in common with the reactionary right-wing populism of France’s Front National than Mussolini’s Fasci di Combattimento. However, it’s true only insofar that these are different political movements in different national and historical contexts. The flaw in this analysis hinges on the fact that 1) fascism is always paired with a heavy dose of right-wing populism, but, more importantly, 2) it forgets the fascist origins of the Front National itself. The Front National’s founder Jean-Marie Le Pen has a long list of fascist sympathies, from his admiration of the Vichy collaborationist leader Marshal Philippe Pétain to being fined for having sold records of Hitler speeches. Additionally, when the Front National was founded in 1972, it was a mélange of violent, extreme-right wing, neo-fascist groups, such as l’Ordre Nouveau (The New Order). Le Pen viewed the jack-boots and violence as not immoral but unproductive and by 1974 convinced the membership to start wearing respectable suits. He also eschewed the language of anti-democracy and instead repurposed the rhetoric of French republican universalism to identify those—Muslims and former colonial subjects—who were too particular to be worthy of inclusion in French society and politics. In a deft piece of political jujitsu, Le Pen re-invented the republican tradition and used its themes of assimilation and the separation of church and state as a rationale to exclude certain people at the borders and to draw internal borders in French society. This should be a warning to those who want to write off Trump as simply an American Le Pen. Le Pen’s Front National is an illustration of how fascist ideas can easily coexist with and utilize democracy to further entrench these ideas. The recent electoral success of Jean-Mare Le Pen’s daughter, Marine Le Pen, is a testament to the political evolution of fascism: fascist in content, democratic in form. In essence, Donald Trump’s rhetoric and policies are these small evils and must be resisted at every step. It’s deeply troubling that though many in the Republican establishment have disavowed his remarks, many others have also said they would support him should he become the presidential nominee. When in power would Trump dismantle the US government with an Enabling Act, demand an oath of personal fealty by the military, or institute anti-Muslim legislation? I’m not sure. Unlike former president George W. Bush, I make no claim to be able to see into men’s souls. However, I am sure that it is the duty of all Americans to resist the rise of Donald Trump to ensure such questions remain in the realm of theory and not practice.